Hello, and Welcome, to www.Improve-Your-Home-and-Garden.com. Home Decorating Ideas meant to inspire and motivate you - to personalize YOUR home to reflect YOUR style. Fall is over, the holidays have passed and it is time to snuggle up to a cozy fire and stay warm inside your home in 2012! Time flies and before you know it, it will be time for another home improvement project. See our basement remodeling tips for a great family room remodel that includes builtins around the fireplace. This is a great cold weather project. Find the perfect fireplace accesories and more at the link below. Are you already thinking about getting outside as soon as possible when the gardening season begins in the spring? Get gardening ideas on this site. And the great part is- with these projects and tips featured on improve-your-home-and-garden.com, as a DIYer you can do these improvements yourself, and save lots of money! Get the Scoop on everything that is going on here-regarding home decorating ideas, gardening and more. Follow us on facebook too. You can do this at the top of the page. It is always Grillin Season here at Improve-your-home-and-garden, make sure to check out our new page, all about grills, and the food you can prepare on your grill. Shop for everything you need for a great grilling and entertaining experience! Check out our GRILLIN TIME STORE! You can enjoy your outdoors more with tips on outdoor spaces, and shop for everything you need from grills, to patio furniture, garden decor and more. We update often, so bookmark this page and plan on a speedy return back to www.Improve-Your-Home-and-Garden.com to get the latest information. UPDATE- The gardening season is here- make sure to check out the My Gardens page on this site, for a tour of my private gardens. You will get inspired to have your best flowers gardens yet, when you take the tour! The link is on the nav bar on the left, under the Improve Your Gardens section. And shop our NEW Home Improvement Specialty Stores listed on the Nav Bar for everything you will need to Improve YOUR Home and Garden and Save Money this year. People move into new places for several reasons- downsizing, job changes, relationship changes, growing families. There are lots of reasons. Why settle for a house that never really feels like YOUR home? You will LOVE your home when you improve it,update, and customize it yourself, to fit YOUR style. Make your house your home by putting your personal touch on it. Our inspiring Home Decorating Ideas and Gardening Tips can help. You can do this by getting motivated with home decorating ideas inspired by our REAL life home improvement experiences. So read on to find out all about it. I have lots of recommendations for your reading pleasure such as the books shown below. You will see these recommendations on various pages of the site. **NEW - I have moved our Rented Mule "Home and Garden store" to this site. Make sure you find out what we have to offer. We have Scrappy Signs by Rented Mule and seeds from Freda's Favorite Flowers, and alot more! The Home and Garden Store is growing daily. 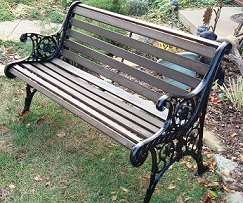 New items include garden benches, accent furniture, home and garden accessories, fireplace screens and more. Notice the Exclusive Decorator Tips featured with these Home Decor Items. They are meant to give you more Home Decorating Ideas. The Rented Mule "Home and Garden Store" link is labeled- Shop-Our Store and it is of the nav bar on the left. The Scrappy Signs link and Flower Seeds links are located below the Shop - Our Store tab. Shop with confidence because we offer Paypal as our payment method. And you can buy gift Certificates thru Paypal for shopping in the Rented Mule Home and Garden Store! It doesn't get any easier than that. In addition to lots of home decorating ideas, this site is full of tips on doing all types of home improvement projects. Lots of photos (100's) have now been added recently to the pages through out the site. So now, you can really understand the topic on the related page. The photos shared on this site, are from our own projects! Looking back I can tell you we have been busy improving OUR home and garden for sure! Projects to inspire you include, but are not limited to - restoring a Garden Bench as shown above, a complete basement remodel which invloves- adding a home office in your basement, and updating and renovating your family room, even redesigning and relocating a laundry room. The photo above shows antique reclaimed Kentucky barnwood beams being installed in the ceiling of our new home office . We offer some unique home decorating ideas with reclaimed barnwood. Our home office is an example.There are detailed photos on how to do lots of projects that will help you Improve Your Home And Garden . I also provide details on Seasonal Home Decorating Ideas , decluttering ,barnwood decor , building a pergola and more. These ideas include home remodeling, decorating and outside projects such as landscaping, gardening, and creating outdoor rooms. 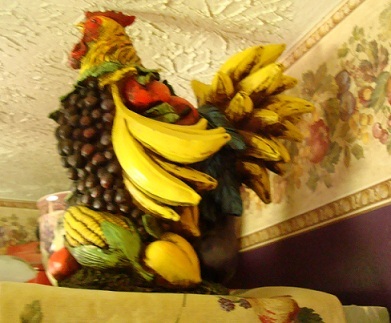 Find out the story about the Rooster above in our new Kitchen Decor Themes page. Now you can even shop for Rooster Decor for yourself at our Rooster Decor Store, one of our Specialty Stores I mentioned earler. You will want to visit often when you are looking for home decorating ideas, or ideas for remodeling your home and more or even when you are shopping for your home and garden! The photo above shows a pergola at the entrance to our secret garden. 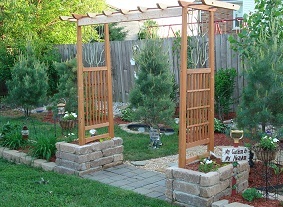 Find out more about creating your own special backyard retreat on the secret garden page. If you have arrived at Improve-Your-Home-and-Garden.com in need of inspiration, you are at the right place. My goal is to inspire you to try new ideas to make you happier in your home environment. I promise to OVER deliver lots of home improvement ideas, decorating tips, gardening ideas, landscape projects, etc. to get you motivated and inspired. You will discover many money saving tips on lots of REAL Projects that we have done ourselves to our home together and to homes we have owned separately in the past. We have had lots of experience in many aspects of home remodeling, decorating and landscaping. And we are very detail oriented. We customize our projects and our home. Now, I look forward to sharing these experiences with you. These home improvement projects are sure to get you thinking. Then, I want to encourage you, to get your hands dirty and dive into some of your own home and garden improvement projects- NOW. When the dust settles, and you have completed your own list of improvements, you will have a great sense of pride in your accomplishments and finally have a home and garden that you love. You will really get the most out your surroundings because your home will be perfect for you, and your family. Not just a house you live in. Get, busy and get - the most out of you home. You won't be able to wait to entertain your friends, and see how impressed they will be with you new skills. Nothing is more rewarding than doing a good job yourself, learning new skills and saving money while you do so. It is finally time to - Just Do It! Let's move on to get started Improving YOUR Home and Garden - Now! 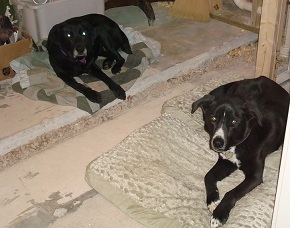 The photo above shows our 2 dogs, CJ and Bronco, in the middle of the basement remodel construction area, while we were renovating our basement. They are affectionaly referred to as our crew chiefs and project managers. Check out the links through out the site for valuable savings on all the things your need for your home, garden and pets! Enjoy the site, and I hope you get inspired and motivated by our home decorating ideas and outdoor projects, to improve your home and garden yourself, too. And when you do make your own improvements tell us about it! At the comment pages and links placed through out the website. Our GRILLIN TIME Store has 1000's of items to make your outdoor cooking experience fun! Find great buys at the Clearance Sale on Home and Garden items, Hurry Limited Time Offers Changing Daily! Shop our Backyard Living Store for everything you need to create the backyard of your dreams! A Secret Garden is a Great Place to Relax after a hard day. An outdoor fire pit is a great way to relax in your backyard during cooler months. Build a Stone Border around your Landscape and Flower Gardens, see How You Can Do It Yourself! Remove A Pine Tree from your front yard landscaping if it has out grown the space and hides the house. 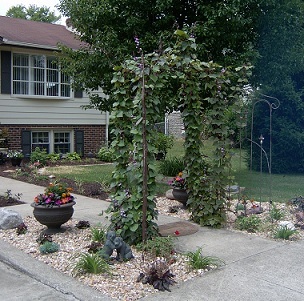 Suggestions for better curb appeal by improving your front yard landscaping. 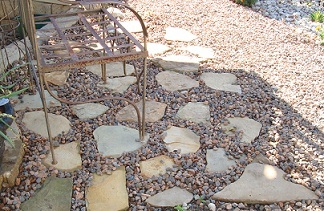 Use natural elements in your landscape decor, such as rocks and tree stumps, get ideas here! Your winter landscape can be beautiful and interesting too! LIMITED TIME OFFER -EARN FREE FLOWER SEEDS WHEN YOU SHOP OUR HOME IMPROVEMENT STORES! Shop for Garden Seeds, to get your Garden Growing Now! Our Garden Supply Store offers everything you need for a Gorgeous Garden that will make you proud! Shop for Garden Decorations Here! A peddlers mall shopping spree can uncover lots of treasures. These Spring Gardening Tips are informative, and fun! Try planting seeds indoors for a longer growing season, on a budget. Enjoy this Gardening addict article about some serious Gardening! Can You Relate? Learn how you can build flower gardens in you landscape for free! 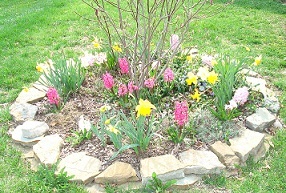 See how to make a flower bed that will get better every year! Build a Greenhouse on YOUR Property, get all the details here! Build a Greenhouse, and enjoy year round gardening! Try these fall gardening chores, to make your home and garden ready for the cold weather ahead. Our Home and Garden Store, features products from Rented Mule. Our Home and Garden Store features product manufactured by us and many hard to find items to improve your home and garden. Shop our Furniture and Home Decor Store , another way to Save Money and Time! Our Kitchen Store is stocked with Everything your need for a great kitchen! Our Kitchen Store is stocked and ready for your cooking needs! Shop Our New Rooster Decor Store, for lots of fun, colorful accents! Our Rooster Decor Store offers plenty of colorful accents for your home and garden! Useful Attic Storage space, can open up your closets and garage for better function, find out how we solved our storage problem! Try these Spring Cleaning Tips, to Spruce up Your Home Now! Spring Cleaning Tips, to inspire you to go beyond just the boring cleaning tasks. Declutter your home. It is a very important way to improve your home and garden. Follow these home staging tips to sell you home quickly! See how we restore furniture and bring it back to life! A basement remodel can enlarge your usable living space. Consider a basement remodel, to make you living space feel larger. We made our home office, work for us, see how. These Holiday Decorating Ideas will Inspire you to Decorate for the Holiday Season! Try these fall decorating ideas to improve the look of your fall landscape. Try these Fall Decorating Ideas at your home to celebrate the season! build a potting bench out of reclaimed barnwood- Find out How here! 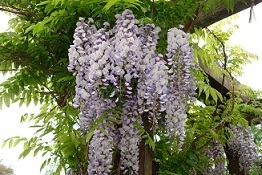 Learn how to build a Pergola to support Wisteria, or any other climbing plant. And get a porch swing support at the same time! Find one of a kind handcrafted barnwood crafts by Rented Mule, limited quanties, while supplies last! These are Start Your Own Business books, designed to inspire you to turn your crafts, hobbies, and passions into a Real Business! Craft and Hobby books that will educate you about YOUR favorite leisure time activities! Discover the fab Job that is perfect for you! Wanna have a Fab Job? Sure you do, everyone does, these guides can get started in the right direction! The Pet Photos featured on this site show our wonderful fur balls we love! My SBI Web Business -Why I love it! Using Moringa I have lost 22 lbs in 7 1/2 weeks! Would you like to share your knowledge about home decorating ideas? Great, find out how you can submit your story or tip here.